This entry was posted on March 31, 2014 by Dan H.. Whether spring has sprung or has yet to appear in your neck of the woods, seasonal decorations are a great way to cheer up a classroom and can serve as an introduction to lessons on weather, local flora, holidays and more. Changing decorations regularly helps provide a visual structure for the school year. 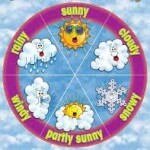 If you buy sturdy weather classroom decorations, a little care when removing them will help them last for years. If you make your own, creating decorations with your students provides a break from the usual lessons while helping them learn about plants and weather. Consider these options for spring decorations that will look lovely and help your students grasp the concepts around changing seasons. Frost bites the dust. The last frost is a sign of spring, but do your students know when that is? Set up a Frost Watch with snowflakes and have students write in the previous day's low temp. Ask if that means if a frost did occur, or if they noticed frost on their way to school. Announce the last frost and remove the weather classroom decorations when the last frost has occurred. April showers-- but how much does April shower? Use dry erase window clings to track spring rain fall. Have your students draw rain clouds on the window clings and write in the amount of precipitation after each time it rains. If your grade has studied clouds, have them draw nimbus clouds, the cloud type most associated with rain. Those April showers do bring May flowers, but what kind of flowers bloom in your area? Find out what is in bloom in your area, and have your students create paper versions of these blossoms. Your students will develop an awareness of the nature surrounding them that goes beyond what a textbook can offer. Teach your students about the actual birds and bees. Feature birds returning from migration in your decorations, and discuss the bees that pollinate the flowers in your area with a chart on beehive hierarchy. The countdown to summer approaches. Track the rising temps with a thermometer cling. Your students will fill in the day's projected high, and you can track the month's weather on a separate chart. As students spend much of their day in climate-controlled buildings and vehicles, weather classroom decorations help them connect to nature even when they can't experience it directly. These ideas will offer your students the chance to expand on science curriculum and practice art concepts while seeing their art displayed proudly.